1Department of Pharmacology, Chalapathi Institute of Pharmaceutical Sciences, Lam, Guntur, 522034, Andhra Pradesh, INDIA. 2UMR 7242 CNRS- Neuroimmunology and Peptide Therapy Team, University of Strasbourg, Biotechnology and Cell Signaling (Strasbourg School of Biotechnology, ESBS), Illkirch, 67400, FRANCE. 3Department of Biotechnology, Vels University, Pallavaram, Chennai-600117, Tamil Nadu, INDIA. 4Department of Research and Development, Sree Balaji Medical College and Hospital, Chromepet, Chennai- 600044, Tamil Nadu, INDIA. Objective: To investigate the phytochemical properties, in vitro antioxidant and in vivo safety profile of leaf extracts of Tragia plukenetii (TP). Methods: TP leaves were obtained from the south part of India (Guntur District, Andhra Pradesh) and it was extracted with different solvents (benzene extract (BE), chloroform extract (CE) and methanolic extract (ME)). These TP extracts were analyzed for the in vitro antioxidant activity by DPPH reducing power, β-carotene-linoleic acid complex and iron chelation assays followed by in vivo acute oral and dermal toxicities using Swiss mice and Wistar rats respectively. Results: The present study results revealed ME exhibited an effective and powerful antioxidant activity when compared to a standard antioxidant, butylated hydroxytoluene (BHT). ME was found to be effective in DPPH, β-carotene-linoleic acid complex and iron chelation assays respectively. In vivo acute oral toxicity study revealed that mice treated with up to 5000 mg/kg of BE, CE and ME did not show any signs of toxicity. Furthermore, similarly, acute dermal toxicity study demonstrated that BE, CE and ME did not exhibit any signs of dermal toxicity up to 1000 mg/kg in rats. Conclusion: TP extracts possess an excellent antioxidant activity with a devoid of any signs of acute oral and dermal toxicities. Bonam SR, Manoharan SK, Pandy V, Raya AR, Nadendla RR, Jagadeesan M, et al. 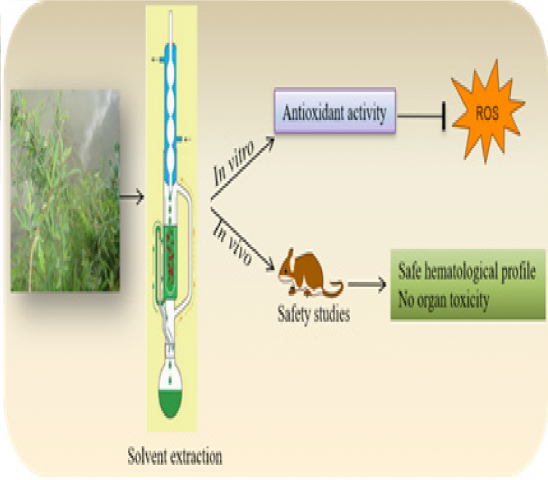 Phytochemical, in vitro Antioxidant and in vivo Safety Evaluation of Leaf Extracts of Tragia plukenetii. Pharmacognosy Journal. 2019;11(2):338-345. Comparative Study of Antioxidant Activity of Ethanol and Aqueous Extracts of Different Parts of Nyctanthes Arbor-tristis Linn.